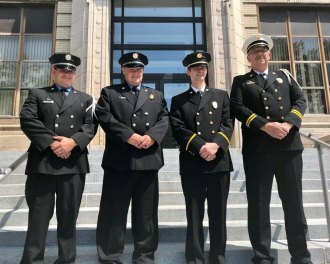 Five Huntington firefighters were promoted during a brief ceremony today at City Hall. Ray Canafax was promoted from Captain to Deputy Chief, Dominick Fraley and J.D. Meade were promoted from Lieutenant to Captain, and Chris Mellert and Timothy Burns were promoted from Private to Lieutenant. 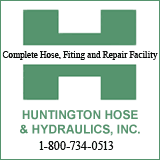 Pictured from left to right are Mellert (third generation Huntington firefighter), Burns, Meade and Canafax. Fraley was unable to attend the ceremony.